Mr. Shelby, a generous Kentuckian who believes in the good treatment of his slaves and does treat them well, is forced to sell off his wife’s worthy slave girl’s son, Harry, and his most faithful pious servant Tom, fondly referred to as ‘Uncle Tom’. He signs the papers of their transfer to a man named Haley, a slave trader, with whom he had to settle debts. No amount of pleading from Mrs. Shelby could change Mr. Shelby’s decision to do so, however bitter his heart felt, as he had high debts with the cruel man which could be cleared only by complying to Haley’s demands of transfer of the beautiful Eliza’s son Harry and faithful Tom! Eliza on overhearing the conversation between Haley and her Master Shelby, and getting to know that her only son Harry was going to be sold over to a trader and then put up in the general auctions for bidders to buy, takes extreme steps and decides to run away that same night. She writes a note to her Mistress, Mrs. Shelby, thanking her for her generosity and stating that she was running off to save her child from inevitable cruelty. Then she picks up her dear son Harry, proceeds to Uncle Tom’s cabin, and informs him of his ill fate. Eliza offers Uncle Tom to run off with her but Uncle Tom refuses telling her that he would always be faithful to his master and would get sold if his master wanted him sold. And, so, Eliza proceeds on her journey all by herself, fueled by ‘maternal love’ and ‘wrought into a paroxysm of frenzy by the near approach of a fearful danger’. From here, the story follows these two people separately, following two simultaneous storylines and finally threads them up together in the end. 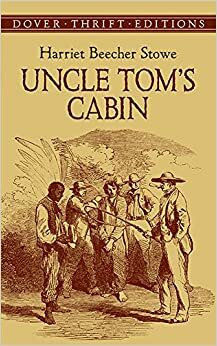 Uncle Tom is bought by Haley and they, with several other slaves of Haley’s ‘band’, board a small ship bound to New Orleans. On the ship, Uncle Tom even wins the loyalty of a cruel man such as Haley by being faithful and religious. A beautiful little girl named Evangeline shortly called as ‘Eva’, travelling with her father Augustine St. Clare and her Aunt Ophelia, takes fancy to poor nice Uncle Tom and persuades her father to buy him. St. Clare buys Tom for a good price and takes him home. There Tom has a good time with the angel-like Eva and his lovely master St. Clare, and many years pass. The other slaves in the house are treated like masters themselves. Meanwhile, Eliza and her little boy Harry, with the aid of many generous people along the way proceed with the aim of reaching Canada- the place where George Harris, her husband, had started running off to. She makes many good hearted friends who go to great lengths to help her get away from men who pursue her on the instructions of wicked Haley. Coming back to Uncle Tom, a few sudden events change his fate. Evangeline dies. And a few weeks later, the poor heart broken man, St. Clare, who promised Uncle Tom his freedom, also dies in an accident. All the slaves of St. Clare are sold off in an auction. Uncle Tom is bought by a tyrant name Legree who is a plantation owner. He goes and works faithfully in the plantation. It is cruel, but Uncle Tom survives it, till one day Legree asks Tom to beat up a woman and Tom refuses to do anything that was cruel or a sin. This invokes the wrath of Legree and he beats up Tom for not obeying him. With many such instances and Tom’s complete faith in God, Legree is astonished by the determination of Uncle Tom. But this only makes Legree angrier and he resolves to change Uncle Tom and make slave not only of Tom’s body but also of his soul. "Well, here's a pious dog, at last, let down among us sinners!—a saint, a gentleman, and no less, to talk to us sinners about our sins! Powerful holy critter, he must be! Here, you rascal, you make believe to be so pious,—didn't you never hear, out of yer Bible, 'Servants, obey yer masters'? An't I yer master? Didn't I pay down twelve hundred dollars, cash, for all there is inside yer old cussed black shell? An't yer mine, now, body and soul?" he said, giving Tom a violent kick with his heavy boot; "tell me!" "No! no! no! my soul an't yours, Mas'r! You haven't bought it,—ye can't buy it! It's been bought and paid for, by one that is able to keep it;—no matter, no matter, you can't harm me!" This piece shows Uncle Tom’s unwavering faith in God which carried him through all his bitter experiences with amazing strength, and which influenced many to follow his method to retain hope and life in their melancholy heart. Master George Shelby, who by this time had grown from a little boy to a young man, comes back in search of his loved Uncle Tom to redeem him and take him back to reunite with his wife and children in the Shelby estate. He traces all the bills of purchase of Uncle Tom and rides out to Legree’s plantation to claim back his Uncle Tom. But there, he finds Uncle Tom in a pathetic state- beaten up and in the doors of death. Uncle Tom recognizes his ‘little Master George’ and declares that he shall ‘die content now’ as he had seen and inquired about the wellness of his family. Uncle Tom rests forever. George, with a broken heart, takes the body of Uncle Tom with him and gives him a decent burial. Meanwhile, Eliza and her child, on their way, reunite with her husband, George and they all escape, after a lot of dangerous adventures, to Canada- a free land! George comes back to the Shelby estate and informs everyone of the sad turn of events. He prepares legal documents and frees every single slave of his estate. He vows to fight against the practice of slavery. While returning he meets two women- Cassy, a runaway from Legree’s estate, and another woman Madame de Thoux. He comes to know that Madame de Thoux is the sister of George Harris and Cassy was the mother of Eliza. He redirects them to Canada. Pity him not! Such a life and death is not for pity! I loved the book! It is such an amazing and touching book. It is simple yet strong! I loved many of those kind characters in the book and despised the cruel! Uncle Tom’s Cabin was really nice.